The Masters Chair is an intelligent tribute to three chair classics, redesigned and interpreted by the creative genius Starck. The "Series 7" by Arne Jacobsen, the "Tulip Armchair" by Eero Saarinen as well as the "Eiffel Chair" by Charles Eames combine with their distinctive silhouettes in a twisted form, creating an original and fascinating mix of styles. Four narrow bars support the generous and comfortable seating area of Masters. Thanks to the special treatment of the chair, he feels sensual velvety. The special feature of the chair is, of course, its backrest, the features of which are the gaps and points of contact caused by the three different crossbars, which pass into the seat edge. Light, practical, stackable and available in many colors, Masters can also be used outdoors. The Chair Masters was awarded the "Good Design Award 2010" by the Chicago Athenaeum - Museum of Architecture and Design. 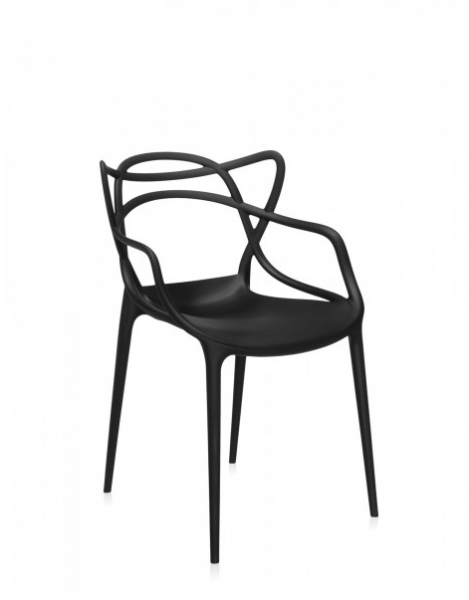 Related links to "Kartell Masters Chair"
Customer evaluation for "Kartell Masters Chair"